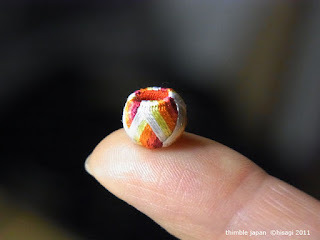 You have probably seen some teeny temari before but you may not have seen teeny tiny Yubinuki. Check out the Thimble Japan website to see the post written about these. The photo below shows just one of the beautiful thimbles featured at this website. I haven't seen her blog before - thanks so much for the link, Rebecca! We got to go to Mariya in Kanazawa and meet Yukiko Onishi and her mother Takako Koide! I didn't realize where we were going or who we would meet until we got there and I recognized them. I'm working my way through photos and so many things to share from our trip - will eventually get this story on my blog too. Those teenie thimbles are amazing!